Gatorade "Dominic" from BlipMobile on Vimeo. If this doesn't sell Gatorade, I don't know what does.. Shorter week (6 days) ended up being a bit of a step back week of 121. I wasn't too good at keeping a good schedule for higher mileage, but a few nagging injuries were quieted down, and I managed to get up to Fish Camp for Shadow of the Giants 50k to sweep the course at a comfortable pace and run with some SoCal Coyote ultra virgins. Part of the sport that I find really enjoyable is helping new runners enjoy the sport more. I didn't have much to go on at my first races other than a sense of adventure and some helpful aid station volunteers, and luckily it all turned out well. This weekened though, I got to head up to Fish Camp with a pack of 8 well preped coyotes, and watch them take on a beautiful and challenging 50k course. 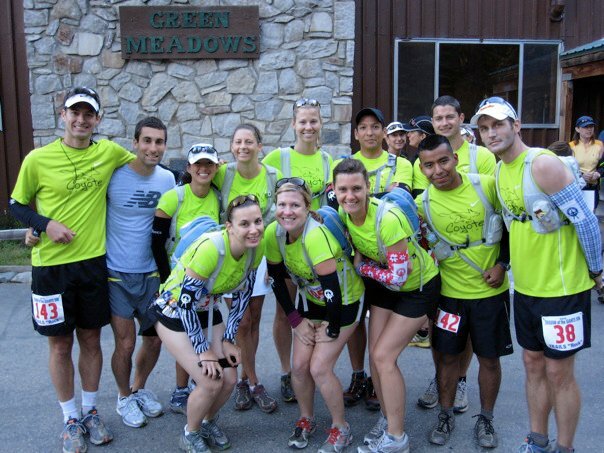 They metamorphed from conservative runners into adventurous, enthusiastic ultra runners with a great sense of accomplishment. Truly a thing of beauty. New ultra kids on the block, getting ready to rock. Sat: 33 miles of casual course sweeping, mostly running and waiting at aid stations.